Bhojpuri YouTube queen Amrapali Dubey’s song Aamrapali Tohare Khatir goes viral once again. The song was released on YouTube in June this year and there is no stopping to it. The song has clocked over 15 million views on YouTube and still counting. The song from the movie Love Ke Liye Kuch Bhi Karega is going strong on YouTube and even after few months of its release. Dressed in red and white lehenga choli, Amrapali looked super hot. She enjoys a huge fan following and never fails to mesmerise fans with her stunning pictures. Love Ke Liye Kuch Bhi Karega has been helmed by Dhiraj Thakur and bankrolled by Satish Dubey and Sunil Singh under the banner of Gayatri Creation. The movie is an action, drama and romance film and is slated to release in 2019. The Bhojpuri film also stars Vishal Singh, Raju Singh Mahi, Surya Sharma, Nilu Singh, Sneha Mishra, Raj Kapoor Sahi, Umesh Mishra, Ayaz Khan, Gopal Rai, Lota Tiwari, RK Goswami and Abhishek Giri. Earlier, her song Champa ki Jawani from Nirahua Hindustani 3, which released in October becomes a rage on social media. The song has garnered more than 2.8 million views on YouTube and still counting. 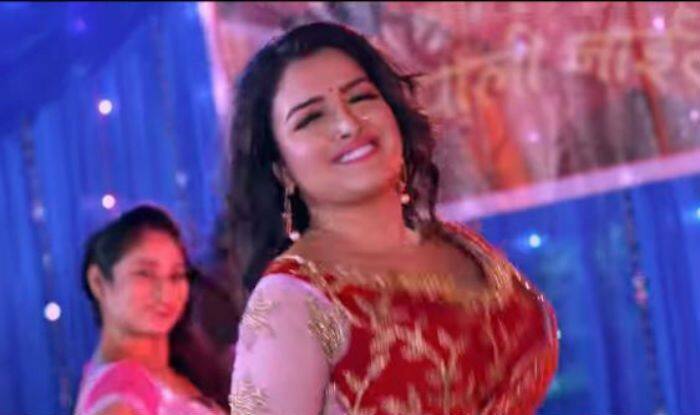 In the song, Amrapali Dubey is dressed in a Maharashtrian in attire. She is donning a pink saree paired with the royal blue blouse. She has accessorised her looks with bangles, maang tika and golden jewellery. With the traditional nose ring and aalta in hands, the actress looked perfect as Marathi Mulgi. Aamrapali Tohare Khatir is sung by Kalpana and lyrics of the songs have been penned down by Aazad Singh. The music has been composed by Rajnish Mishra. Currently, Amrapali is gearing up to take the digital world by storm with Dinesh Lal Yadav. They will make their web-series debut in ALTBalaji’s first-ever Bhojpuri show Hero Vardiwala. The web-series, which will be written and directed by Mahesh Pandey, also features Karan Pandey, Vikrant Singh Rajpoot, Sanjay Pandey, Vinod Mishra, Kanak Pandey, Manoj Singh Tiger and Priyanka Pandit aka Gargi in important roles.